NO EXIT ZINE: NO EXIT #2 OUT NOW! NO EXIT #2 OUT NOW! HEY PUNKS! !...THE SECOND ISSUE OF NO EXIT ZINE ( previously known as no future) IS FINALLY HERE!!!! 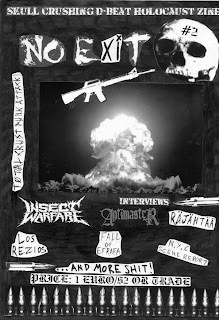 48 B/W PAGES,INTERVIEWS WITH: ANTIMASTER (crust from Mexico),INSECT WARFARE (harsh grindcore from Texas,u.s),FALL OF EFRAFA (epic crust from the u.k),LOS REZIOS (crust,d-beat punk from Peru),RAJAHTAA (80's finnish hc from Greece) ....PLUS AN IN DEPTH NEW YORK CITY SCENE REPORT! AND ALSO SOME COLUMNS FROM US! THE PRICE IS 2,50 euros/$3,BUT IF YOU MAKE A ZINE WE WOULD BE HAPPY TO TRADE!